Making a home light, bright and inviting! ...and here's the After! The room was always attractive, but it was time to lighten things up. ...and how that same wall looks now. Are you loving that accent rug? Me too. Meeee-yow! Pretty fandabulous! The metallic finish on the top makes my heart beat faster! We took down the sheers on the back windows and replaced them with my favorite roller shades that go up and down with the touch of a finger. When rolled completely up, they just disappear. 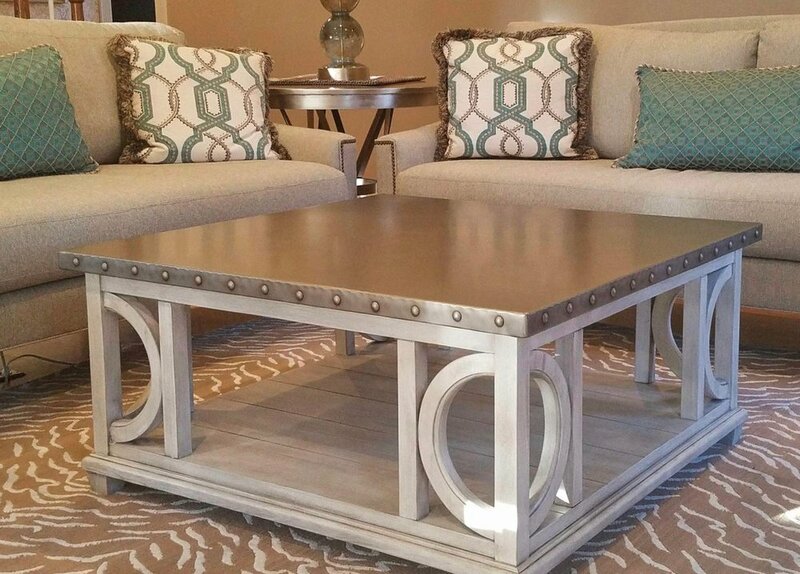 Such nice nailhead detail on the Sherrill sofas! 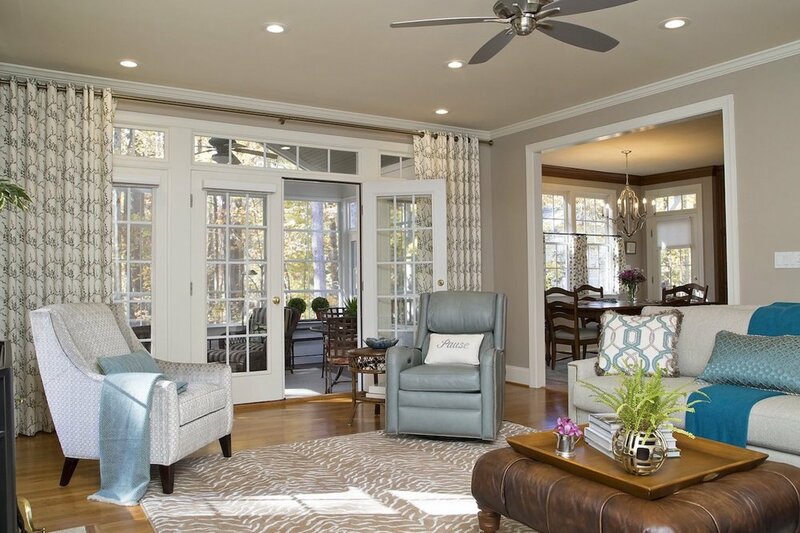 Custom accent pillows, window treatments and that fab rug add color and pattern to an otherwise neutral room. Morning coffee in here will really put you in the right mood to start the day! We used french returns on the metal rods for the custom cafe curtains. Tres bien! 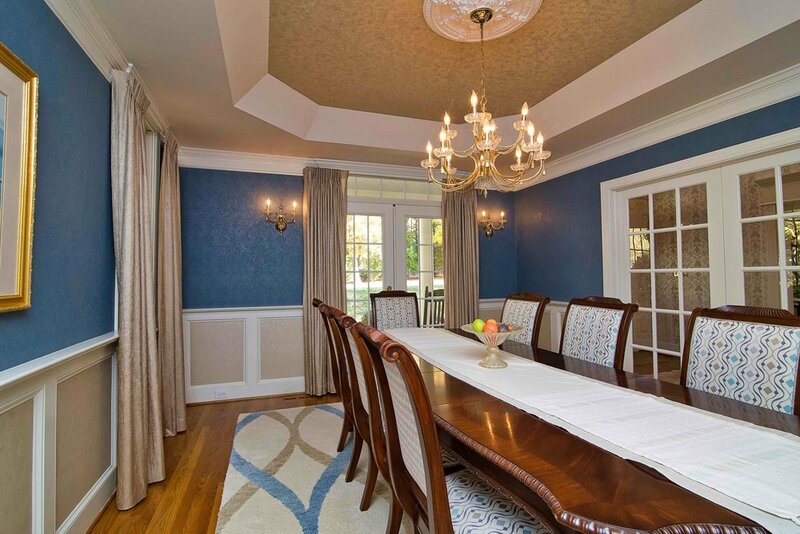 Then we tackled the formal dining room. The Before will show that it was already a gracious, traditional space with lively colors, custom window treatments and a gorgeous table. These clients were just ready for a change. A general updating with a calm vibe was the goal. The heavy top treatments came off the windows, a new custom rug was designed and the dining chairs were reupholstered. 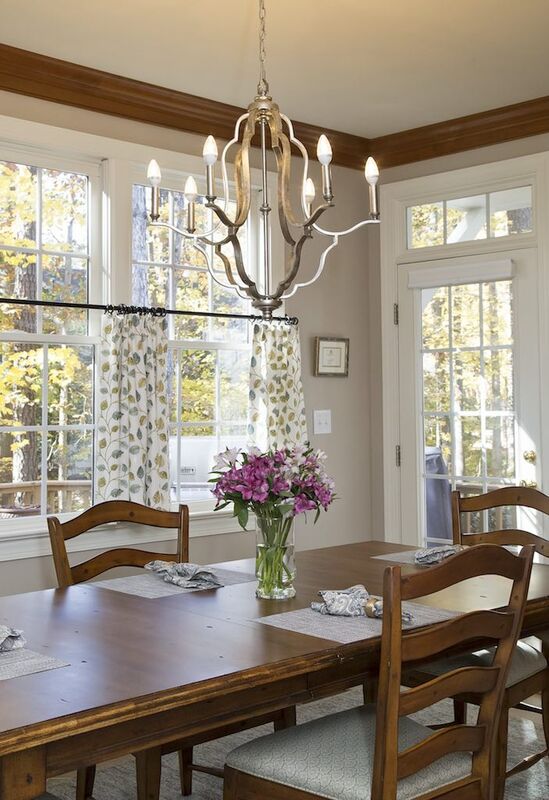 This room is still formal, but in a lighter, brighter and more modern way. I always try to use 2 upholstery fabrics on dining chairs. It's a subtle touch. When you're in the room, I want you to find little design surprises slowly but surely. This entire project was a treat to work on. We were able to make big and small changes that added up to a refresh that flows from room to room and really reflects the personalities and lifestyle of the clients. Are you ready to update your fireplace? If so, I've got 3 tips to share with you, along with a couple of photos from a recent project. Above is the "before" fireplace photo. My clients wanted to put the flat screen tv above the mantel and bring a more transitional style in the room. It's like someone turned on the lights! Tip #1 - create more visual space on the fireplace wall. We did it by pulling the new custom window treatments over to the side. This gives a more open feeling. Tip #2 - use a new material. In this case, we tore the whole sheetrock, brick and wood face down and rebuilt it with stacked travertine. The stone wraps to the wall, creating 3" sides so it doesn't look flat. The mason had to replace the old sheetrock with Durock cement board, but that's standard when working with heavy tile. The hearth floor got a sturdy porcelain tile. Looks fabulous! Tip #3 - Consider using a nice chunky board from the lumberyard as your mantel. This piece of poplar, stained a walnut color by our crackerjack carpenter, is less rustic, more refined than a reclaimed beam. He also created what I'll call a backsplash with the poplar because we made the whole shebang a little lower than the old fireplace. With 9' ceilings, we needed more breathing space for the TV. I think the sound bar (sitting in the center of the mantel) looks better in front of wood rather than a painted sheetrock wall. Tip #4 - this isn't really a tip, it's a thought. I understand the desire to get rid of entertainment centers, so the TV has to go somewhere--often it's above the fireplace. But look how pretty the room is with a piece of artwork on the wall! This is "Misty No. 1" by the talented Michelle Woolley Sauter of One Coast Design. I photoshopped it in, with her permission. I love the frameless style. This was a perfectly nice custom built entertainment center, about 16 years old. Isn't it amazing how things have changed over those years? It's hard to keep up with everything about TV's, including how to install them! To recap - visually lighten the space, change out your hearth material and use a chunky piece of wood as a mantel. Then light that fire and enjoy! New Construction Design Details That Make A Big Difference! Investing in a design consultation during new construction provides ideas that can make a big difference to the end result. I want to show you a couple of pics I took last week of a new construction project I consulted on. The homeowners, John and Diane, were wonderful to work with and the builder, John Dunning of Dunning Custom Homes, did a spectacular job. When Diane invited me to come see the finished results, I was happy to accept! I've been crushing on stainless cable wire for a long time now, but it still gives me a thrill. When I mentioned this idea to John and Diane, they jumped right on it. Diane said waiting for it to be installed was like waiting for Christmas morning! Another idea they ran with was to paint the barn door leading to the pantry a true red. This is Sherwin's Heritage Red, which is gorgeous, gorgeous. Most of the other doors in the house are hickory with a protective coat of polyurethane. The door to the garage, as you ca see, is white. I LOVE it when doors DON'T match! And look at that hickory floor. Again, just a clear coat of poly. Amazing. Here's a better view of a hickory door in the house. We talked a lot about using beams in the house. Final decisions can't be made until sheet rock goes up and everyone can really see the room taking shape. These are in the Kitchen and look great! John and Diane are big fans of wood. They put this yummy walnut on the island counter. Love it, love it, love it. The light was really mucking around with my trusty iPhone camera, the art isn't up over the mantel yet and decorating isn't complete, but I wanted to show you that built in shelving doesn't have to symmetrically flank the fireplace. My suggestion was to have the cabinetry and shelving on one side to display and store what they wanted, but to leave the other side open to create a cozy nook to curl up with a book. It's going to be a sweet spot in a beautiful room. I also convinced them to skip putting a soffit at the top of each niche. Bring the eye up! I take no credit for this brilliant bit of great design in the Kitchen. It's built under the stairs and is out of the way from everything else in the room. Microwave, wine fridge, glassware, etc. - you can be pouring wine, heating things up, pulling out tableware, napkins, small plates, etc. and still be completely out of the way of the master chef. Like I said, brilliant! That's soapstone on the counters. Lovely handcrafted shelving with puck lights make everything sparkle. A Wolf cooktop looks right at home in the center of it all! The house, upstairs and down, is filled with great ideas, successfully executed. It's a wonderful example of attention to detail, creative thinking and pride in workmanship.